“The True Adventures of Carbon” from Christian Faith Publishing authors Sue Lamoree and Nyle Kinghorn is the captivating story based on true events starring the lovable and spirited young pony named Carbon, who goes on various adventures and misadventures on Pa’s small family farm, where he encounters several barnyard animals whom he befriends and learns from as he grows into a fine stallion. “The True Adventures of Carbon”: heartwarming stories from the life of a lively young stallion. 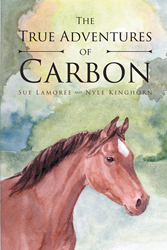 “The True Adventures of Carbon” is the creation of published authors Sue Lamoree, a hobbyist horseback-rider and watercolorist who lives on Camano Island, Washington, with her husband and two dogs and who has published works under the penname Sue Hutchinson; and Nyle Kinghorn, a businessman, musician, and country boy at heart who grew up working in his family’s farm in Idaho and introduced Carbon’s story to Sue. Published by Christian Faith Publishing, Sue Lamoree and Nyle Kinghorn’s new book is a loving dedication to the beloved real-life Carbon, who lived a long and full life with Kinghorn’s family until his twentieth year. As with many animal story classics, Carbon’s antics and big heart will touch the hearts of children and adults everywhere. View a synopsis of “The True Adventures of Carbon” on YouTube. Consumers can purchase “The True Adventures of Carbon” at traditional brick & mortar bookstores, or online at Amazon.com, Apple iTunes store, or Barnes and Noble. For additional information or inquiries about “The True Adventures of Carbon”, contact the Christian Faith Publishing media department at 866-554-0919.